McAfee and Facebook have teamed up to create security solutions that include McAfee security software, a custom scanning and repair tool, and consumer friendly education materials which will be available to more than 350 million Facebook users. With this partnership, the Facebook users will be eligible for a free six-month subscription to McAfee Internet Security Suite software. After the six-month period, the Facebook users can renew their subscription at a 30% discounted rate. The McAfee Internet Security Suite software which provided by McAfee provides protection against viruses, spyware, hackers, online scammers, identity thieves and other cyber-criminal activities, as well as includes the award-winning McAfee SiteAdvisor site rating technology. 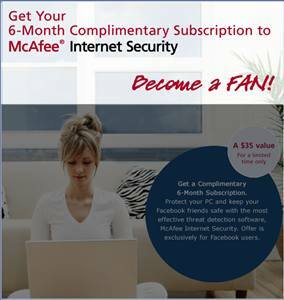 Sign up or log in to Facebook to connect with McAfee at . After logging in, add McAfee as a friend, and then go to Protect Your PC tab. Select your country and click on Get Yours Now button. Note: McAfee Internet Security Suite software will be available to Facebook users in the U.S, U.K, Australia, Italy, Germany, the Netherlands, Spain, France, Canada, Mexico and Brazil. Click on Get Started Now button. Tip: It’s possible to directly access the promotional URL above, skipping Facebook process. 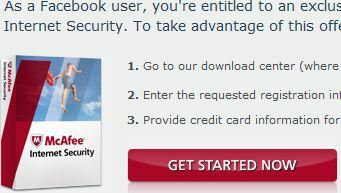 Sign up or login to McAfee. Facebook users are required to enter your credit card information also. But the credit card will not be charged at this time and will be automatically renewed at 30% discounted rate once subscription expired. To cancel this automatic renewal, please contact McAfee Customer Support at 866-622-3911 prior to the expiration of your 6-month complimentary subscription. 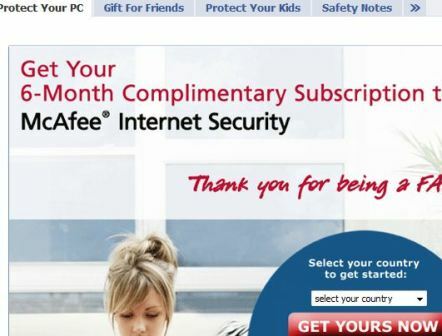 After completing checkout process, McAfee Internet Security is available for free downloading. Currently, the offer is applicable for McAfee Internet Security 2010, and the offer should be good for any future version of McAfee Internet Security, i.e. 2011, 2012 and etc too. Update: The promotion is now applicable for , and do check out more free anti-virus promo.